Learn How to Get the Pay You Want from the “Universal Paymaster”! 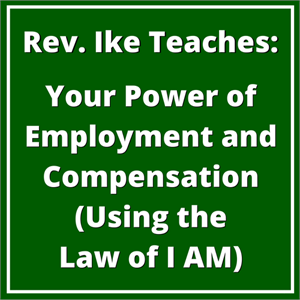 In his powerful hour-long audio lesson on MP3, “Your Power of Employment and Compensation (Using the Law of I AM)” Rev. 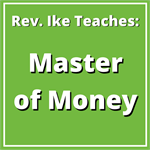 Ike lets you know the right one to work for and teaches you how to determine your pay — and get it! Rev. 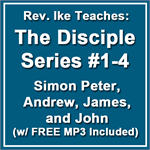 Ike bases this eye-opening audio teaching on Jesus’s statement: “I must be about my Father’s business." He begins by explaining exactly who Jesus is ...NOT who the theologians say he is! And once you understand that — you learn that your first job is the same as Jesus’s job! Your First Job — Your only true job — is working with I Am. In this life-changing lesson, you will learn how to work with the “Law of I AM" and how to use it to manifest the good that you desire in your life! Learn How to Use The Universal law of Compensation to Get What you Deserve! Rev. 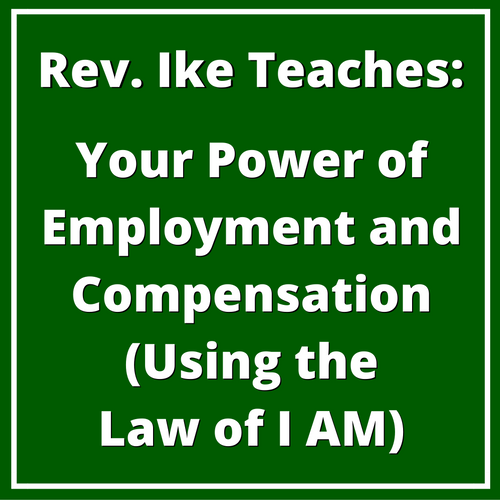 Ike brings this lesson home with real-life examples of using the Law of I AM — the right way — and the wrong way! He tells you how he used it to lose weight! He teaches you his unconventional method of praying (that gets results)! You’ll learn why you must ‘be definite with the infinite’ as he relates how a young woman found her ideal husband, using Rev. Ike’s techniques. You’ll learn how to apply Visualization to the Law of I AM, as you ’experience a tropical vacation’ during a Visualization Treatment with Rev. Ike. As you listen to Rev. Ike and repeat after him, you will learn that the one paymaster is the universal Law of Compensation and you are paid according to your self-image and according to what you believe about yourself! Where you work, or who you work for materially, are only secondary matters — there is only one universal paymaster and that is consciousness, I Am, thought. And in this lesson, you learn HOW to work with “I AM” to get the pay that you want! You learn that your real work, your most important work, is in your mind. And Rev. Ike teaches you HOW to work with your mind, your thoughts, your attitude! Once you get that right, you won’t have to worry about your material job! Throughout the lesson, you will repeat these truths after Rev. Ike, to embed them deep within your consciousness! Final Visualization Treatment with Rev. Ike! The powerful conclusion to this lesson is an Affirmation/Visualization Treatment that you participate in with Rev. Ike, that will raise your consciousness — and set you up to receive the kind of job you want — doing the work that you love to do, and receiving abundant compensation in terms of self-fulfillment, satisfaction, and the MONEY that you deserve! After you complete this lesson and take it to heart, you’ll be ready to discover some delightful surprises in your life — new talents — new blessings — and new REWARDS!